You might have seen a new spoon or hair brush shaped makeup brush used by some beauty bloggers in their Vlogs if not then you will soon as it is going to be so much in rave i suspect. To be honest when first i saw it in a random video on Facebook i never expected it to be a real tool. Well silly me these are pretty much real and are introduced by Artis Brush. They claim that Artis brushes are different then conventional makeup brushes. Matthew Waitesmith the former senior vice president at MAC Cosmetics reinvented the tools not just for professionals, but for novices, too. Apparently MAC had introduced these type some years ago but they are getting famous now because of Artis brush who have almost 10 brushes in their collection. I have not tried these type of brushes and was curious to know more about them before spending a whole lot of bucks on them. A modern yet classic shape that includes a curved flattened handle that fits the contours of the hands and fingers. A fiber bundle that is perpendicular to the plane of the handle to help maximize application of makeup product. A fiber bundle that is angled down from the plane of the handle to help accommodate the different planes and shapes of face. Weight balanced handles which assist in product application and ease of use. 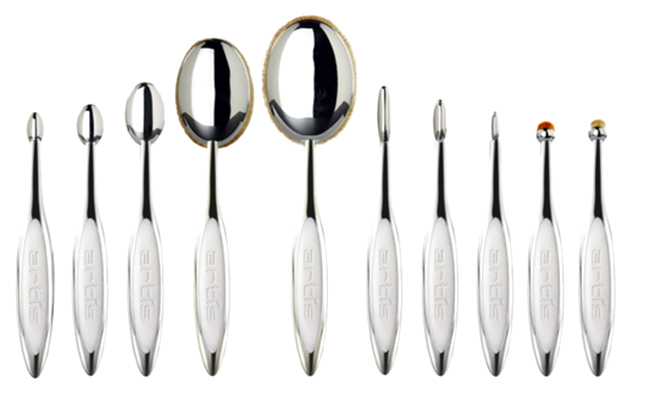 Shaped fiber bundles that reflect the natural contours of the face. A trade mark engineered fiber [Cosmefiber] that produces superior application and blending of product formulas. These brushes claims to provide uniform application with dense, microscopically small and soft fibers. It provides superior blending with ultra fine tip which blends on a microscopic level, creating patterns so small they are imperceptible with the naked eye and provides very gentle feel during application of makeup. It provide efficient use of product with uniform surface area of each CosmeFibre which helps pickup and lay down product, without holding on to it. CosmeFibre is made with a proprietary material that has some shape memory which retains shape better than conventional animal hairs. Versatile brush which helps the fibre perform well with powders, liquids or emollient-based products. To helps avoid sensitivities, CosmeFibre provides an excellent animal-free alternative to conventional animal hair makeup brushes. All Artis brushes are 100% Animal-Free. The CosmeFibre is made using high tech manufacturing process that produces completely consistent fibres and is shaped and refined by hand into fibre bundles, and each brush is hand-assembled to create the artisan-quality Artis Brushes. These brushes are chemically resistant which resists excess water, alcohol, acids, detergent. 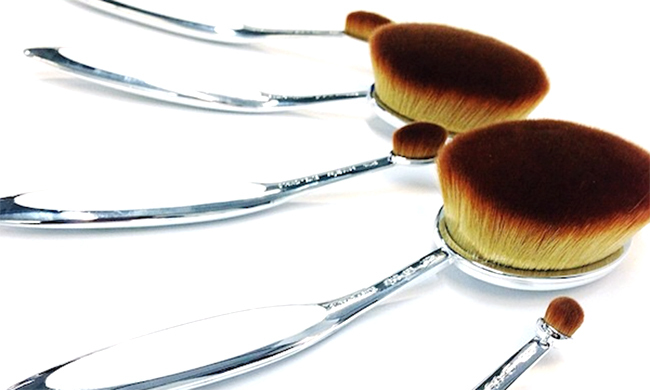 Artis brushes won’t degrade from brush cleaning formulas. Artis believes that it is time to evolve what a makeup brush could be and shouldn’t a makeup brush, that is a tool used to create beauty, be beautiful itself? Well it is a lot to peruse a beauty blogger and a makeup lover like my self but do you know what is the price of single Oval 8 brush, it is $65. Well it is not an easy investment and i have to think about it many times. 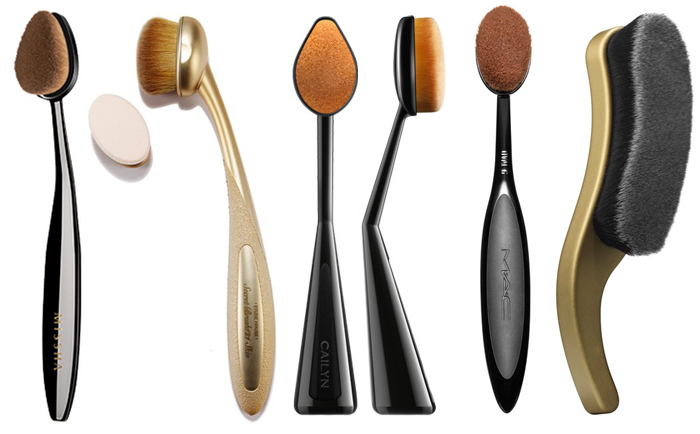 Mean while i have spotted dupes of Artis brush which are getting so popular as well and let me introduce them to you. The most famous dupe of Artis brush is Missha Professional Oval Makeup Brush which is priced €12 on their website but it is also available at Ebay.com for $10 to $12. Etude House My Beauty Tool Secret Brush is more fancy looking brush which is smaller in size but densely packed. It is Priced $16.80. It also comes with sponge applicator and you can replace the heads for your convenience. Cailyn cosmetics have also created this style of brush called O! Wow brush which is Priced $32 at their website but on Amazon it is priced for less then original. MAC Master class brushes were created by Artis in 2013 before they introduced their own collection of brushes. MAC Oval 6 is Priced $42. Looks like more a hair brush Besame Boudoir short hair contour brush is Priced $48 at Sephora and is in the market for few years. It is a large brush but looked densely packed as others. And how can there will not be a cheapest version from China. You can find the similar shaped brushes on many online stores selling it from $2 and onward. What do you think about these brushes? Will you purchase them or not? Is it worth buying the original or dupe? Do let me know your thoughts.